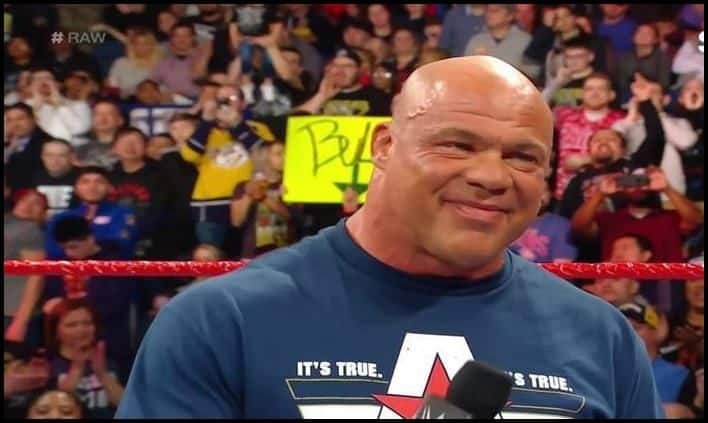 Kurt Angle announced on the latest episode of Monday Night RAW, that he will take on his rival Baron Corbin in his last-ever match in Wrestlemania 35. World Wrestling Entertainment (WWE) legend Kurt Angle had earlier announced that he will be wrestling his last match at the upcoming pay-per-view, Wrestlemania 35. Amidst speculations about who his opponent is going to be, Angle on the latest episode on Monday Night RAW that he will be going up against Baron Corbin. Following his announcement, the fans at the Allstate Arena in Chicago did not appreciate the decision and they booed when Corbin’s name was announced. The WWE Universe expected the Hall of Famer to end his career in the ring with one of the big names in the industry like Undertaker or John Cena but that did not happen and it, quite evidently, left the fans in utter disappointment. The Olympic gold medallist announced his retirement in last week’s Monday Night RAW and extended his gratitude towards the fans, However, one question that lingered on the mind of the fans who will be his opponent in the grandest stage of wrestling entertainment and that was cleared in the latest episode. Earlier, Angle had taken to social media to hint his retirement following which there were rumors doing the rounds that he may call it the end ahead of WrestleMania. “20 years ago, I stepped foot into a WWE ring. I told myself back then I would only go 5 years. But because of the #WWEUniverse, I continued to keep wrestling, although I left WWE for 11 of the 20 years. It feels great being able to end my career where I started. #itstrue #wwe #thankyouwweuniverse,” he wrote on Instagram. Although the wrestler was not an in-ring regular ever since his return from TNA, he mostly played the role of the General manager of WWE’S weekly RAW, only making occasional appearances in the ring during special events. His latest encounter was against Baron Corbin and that ended in his favour.